Once known as 'Sone Ki Chidiya' (Golden Bird), India which was recognized as the wealthiest land in the ancient times, still holds a respectful stature in the world, for its endowment with enchanting and eye-catching architectural works. It is this beauty that attracts thousands of tourists, students, and curious architects annually to the country over and over again. Whether it is the mesmerizing sight of Taj Mahal or the historic Red Fort, the country is filled with several enduring monuments which are enough to keep a person's attention captivated for hours. Hence, the creators or the architects of these monuments over the years have been given great footing in the Indian history. With Prime Minister Narendra Modi proposing in his Development Agenda, for development of 100 Smart Cities, 40 million dwelling units and 20 million affordable homes, the country is in strong need of skilled architects like never before. Given the satisfying graph of the architectural career, today the youth of the country are now looking forward to embracing this profession, with skyscrapers in their eyes and dreams to evolve as a remarkable force in Indian architecture. Anyone who has a creative bent of mind, an artistic hand, and can handle a decent amount of math and geometry, architecture can prove as a perfect calling. However, for shaping the future of aspiring architects, a large number of institutes have also popped up in the recent years which ensure the students for a productive learning experience. This leaves the students in a confused state on deciding which one will be the right college for them to fulfill their architectural dream. Therefore, we at Higher Education Review, have taken the onus on us to present before you a list of architecture institutes as ‘Top 10 Promising Architecture Colleges' which are the one that has achieved an excellence in transferring quality education and gifts the capability to the prospective learners of creating their own masterpiece in this ever-growing concrete world. In the next few pages, you will come across the few eminent architecture institutes of the country that has been very precisely chosen by our team of expert panel and researchers with the motto of helping you in the pursuit of your goals. College of Architecture Trivandrum Trivandrum, Kerala Promoted by Narayanan and Vaidyanathan Charitable and Educational Trust, CAT is a well-name in the architectural education arena in the southern part of the country. D Y Patil School of Architecture Pune, Maharashtra An institution dedicated to D. Y. Patil Group's mission of imparting modern updated education, D Y Patil School of Architecture since its inception has been instrumental in gifting the industry with highly skilled architects. Department of Architecture, BIT Mesra Patna, Bihar One of the premiere institutes in the country, the Department of Architecture of BIT Mesra was initiated in 2012 with the motto of providing sound practical and academic knowledge to the learners. 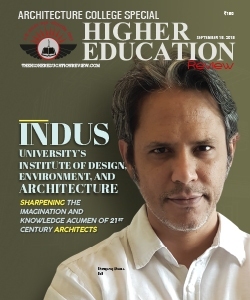 Indus University Ahmedabad, Gujarat The Indus Design School of Indus University is one such institute which has over the years for its demonstrated excellence and quality has emerged as a favorite destination for the future architects. MBS School of Planning and Architecture New Delhi, Delhi Established in 2009, the institute is committed to meet the ever-changing needs and challenges of the future needs of architecture by training a breed of architects who will possess professional ethics and substantial knowledge. RV College of Architecture Bengaluru, Karnataka Offering Bachelors and Masters Degree in Architecture, the institute boasts of a qualified team of faculty members and several National and International collaborations for making the education of the students more fruitful. RVS School of Architecture Coimbatore, Tamil Nadu The institute ensures for a bright and constructive career path to the students by adopting the best teaching techniques with the appropriate blending of practical and theoretical approaches. Sasi Creative School of Architecture Coimbatore, Tamil Nadu Giving utmost priority to incorporate creativity in the process of teaching and learning, the institute develops the students in a way where they can think innovatively and bring in out-of-the-box ideas. Sir J. J. College of Architecture Mumbai, Maharashtra Decorated with state-of-the-art facilities, the institute provides the students a unique learning experience which will help them to proceed towards a right path of success. Sri Venkateshwara College Of Architecture Hyderabad, Telangana Affiliated with Jawaharlal Nehru Architecture and Fine Arts University, the institute is highly recognized for imparting quality and holistic education to the students and preparing them for the race of life.